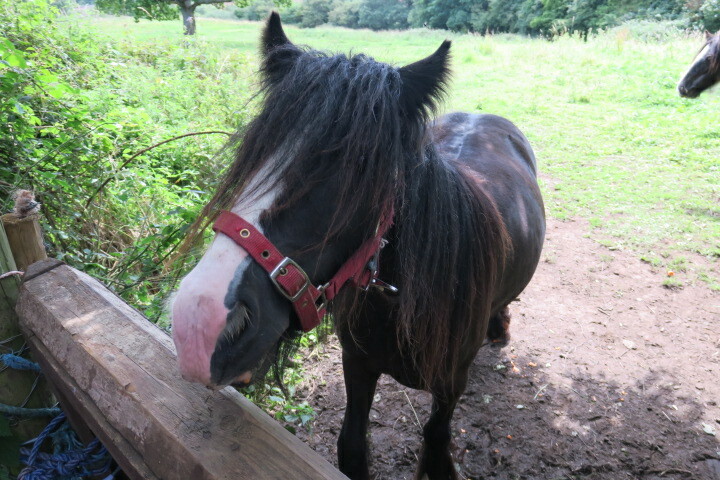 Our plan for this (unusual) sunny day was to hire bikes and cycle the Cinder Track. 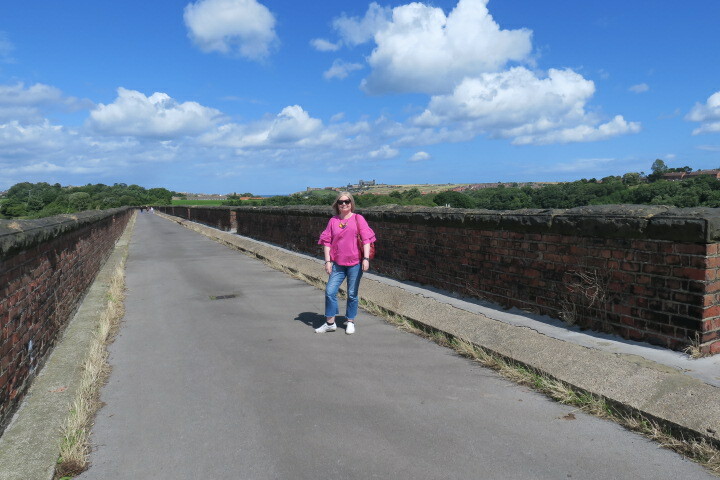 This former railway line runs between Scarborough and Whitby and promised a flat but scenic cycle route. We hadn’t brought our own bikes on this trip and when I happened to glance at the bike hire place the evening before to check out their opening times, the eye wateringly expensive rates put me off. 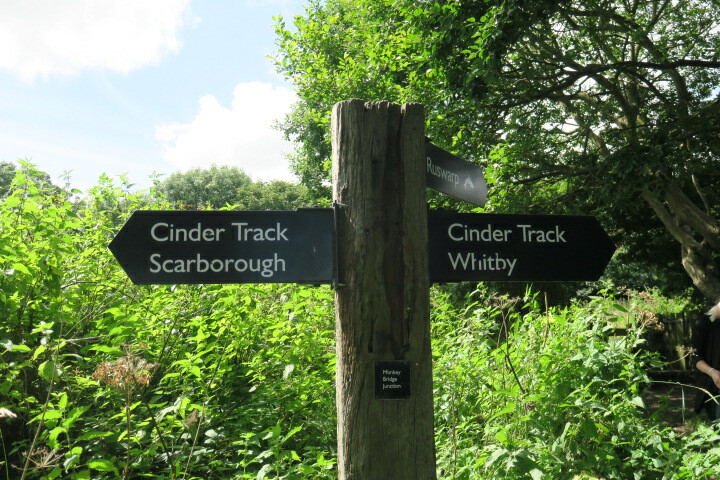 Husband was still keen to experience a bit of the Cinder Track so we decided to walk part of it instead. 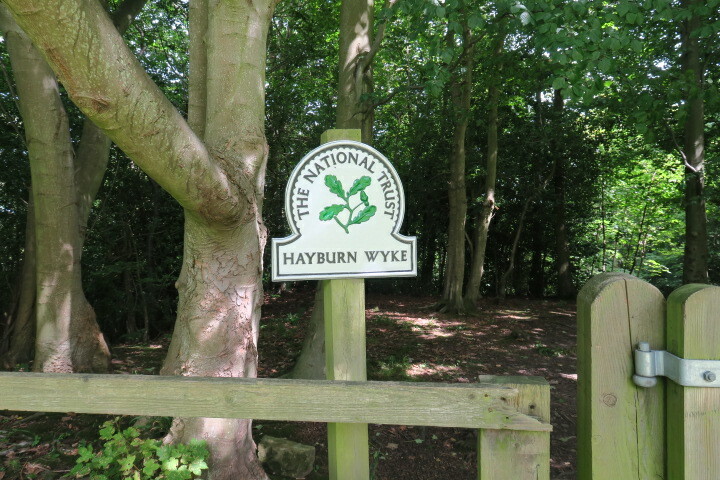 Back to the car and our next stop was Hayburn Wyke. I had read about this in the tourist leaflets in our rental cottage. 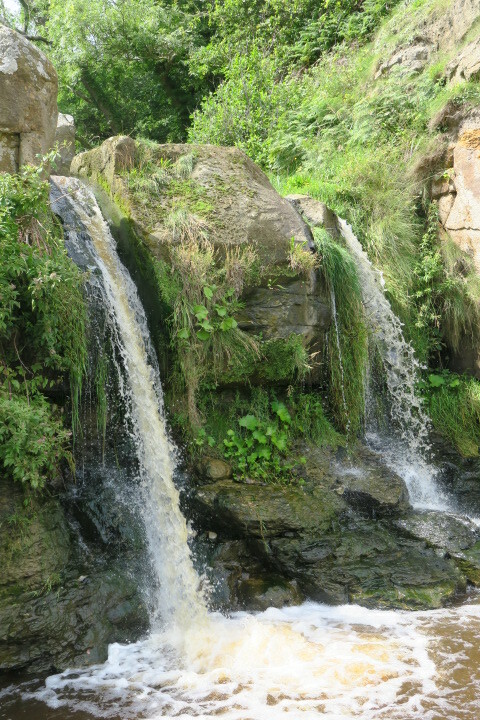 A secluded waterfall sounded just the thing for a sunny afternoon. 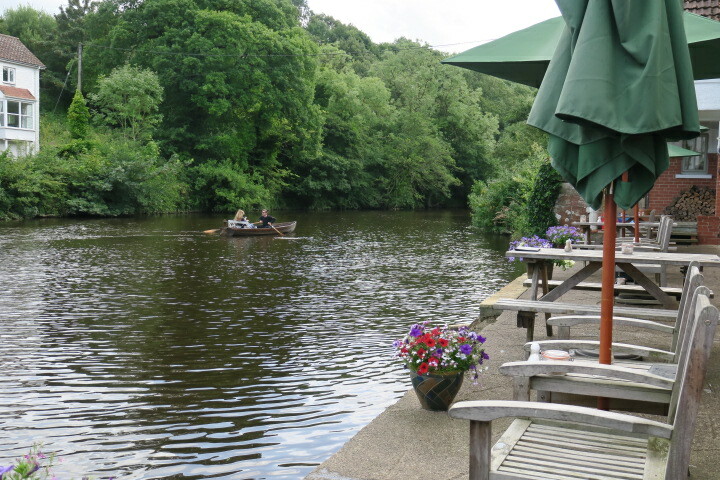 We steered our way down some narrow country lanes, found a gorgeous looking pub and I must admit were sorely tempted to forego the waterfall in favour of a seat in their garden with a cool drink soaking up the sunshine. We didn’t though. 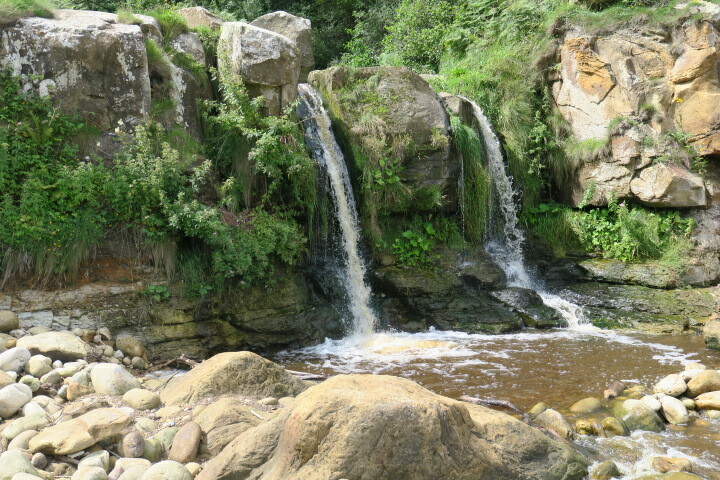 The waterfall it was. 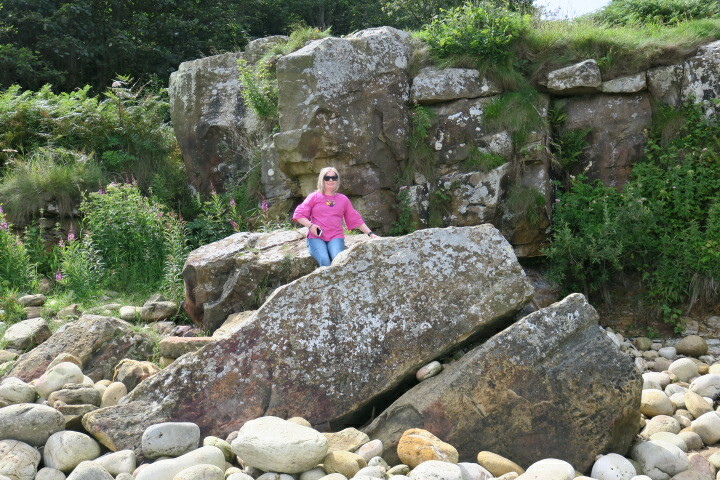 Hayburn Wyke is most definitely secluded. 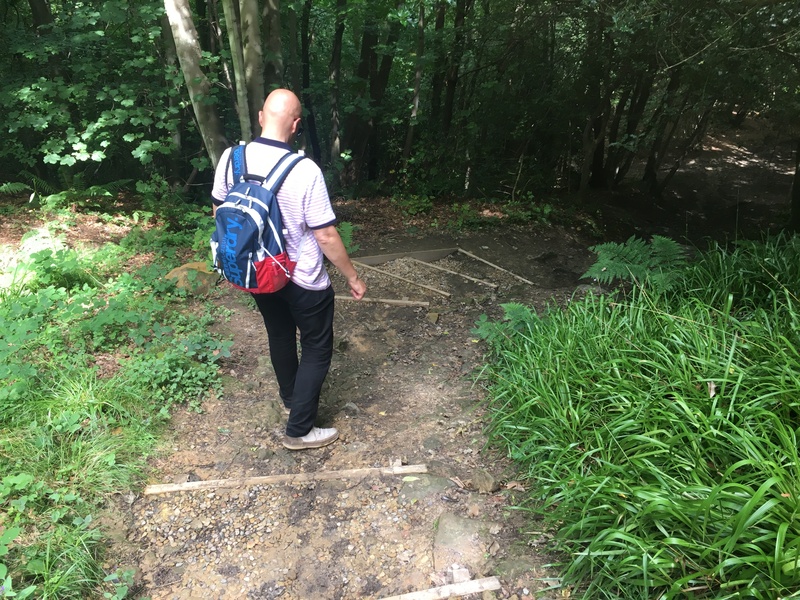 Instructions from the pub took us through a field of cows – thankfully they were lazy, sleepy and paid no attention to us – and down several steep sets of steps and a rather steep incline. 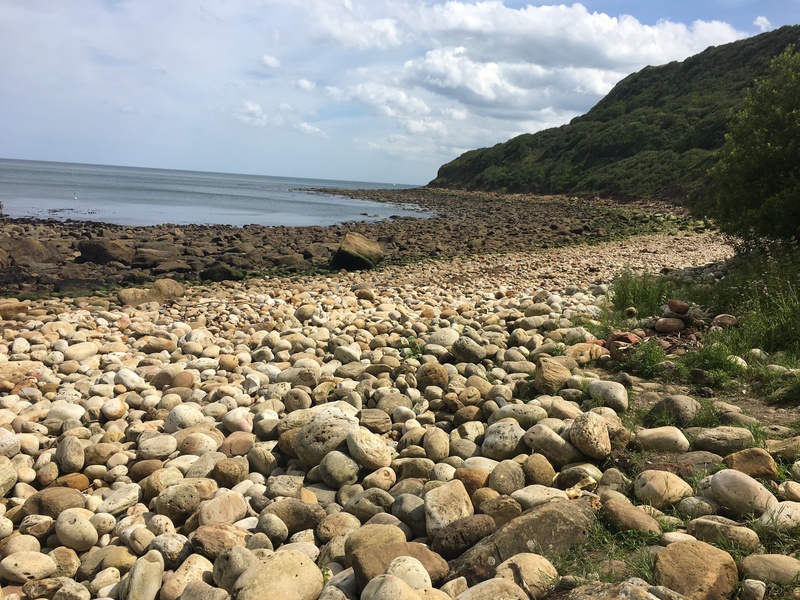 Sweating and with trembly knees we emerged at the most beautiful, pebbly beach. A quiet and scenic spot for sure, we (perhaps not surprisingly) were the only people there. We sat for a while, got our breath back and took in those lovely views. 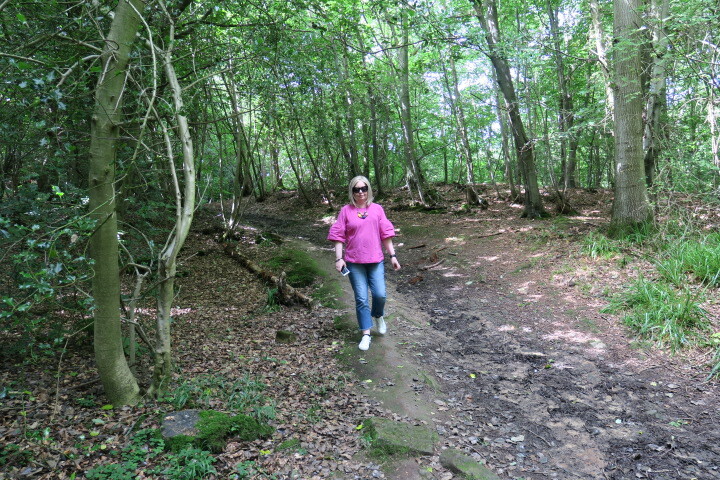 Of course it was uphill all the way back…. quite a climb and quite a hike, tough going in the sunshine too but we (eventually) made it. 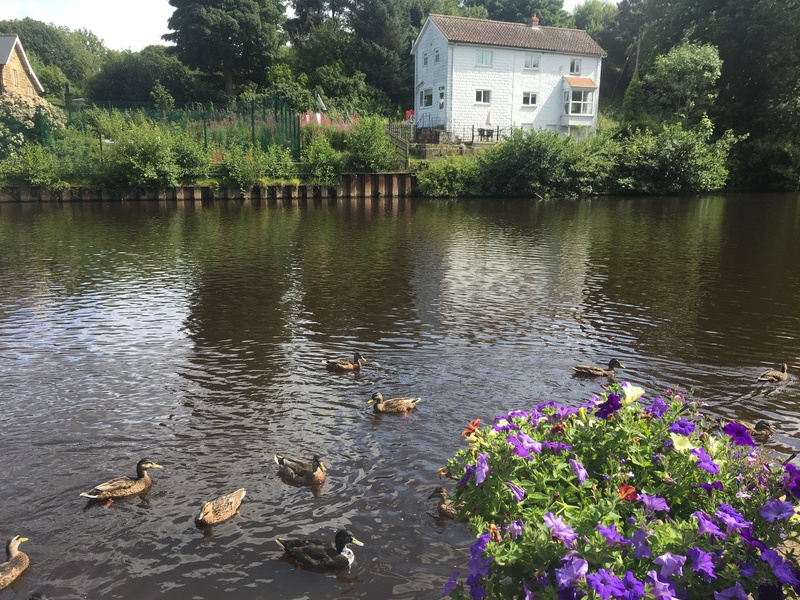 On the drive back to Staithes we took a detour inland to Ruswarp. 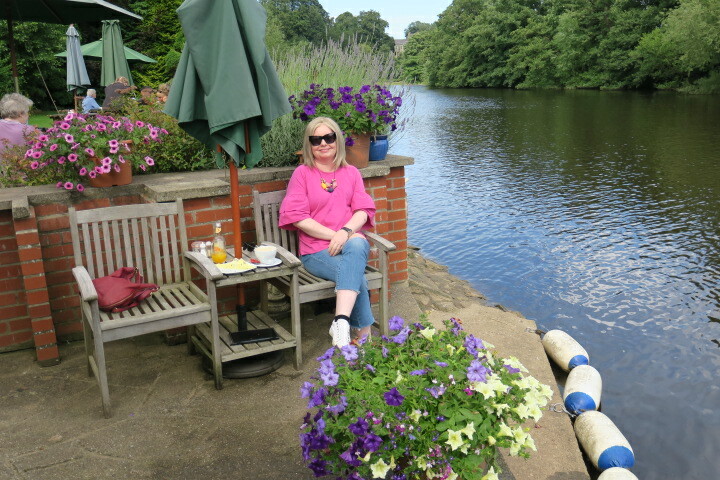 Another sleepy village, we found a cafe by a river, sat with drinks and watched rowing boats glide up and down the water. The perfect way to rest our weary limbs after all that hiking. The day ended with a last flash of excitement when the lady watering the beautiful flowers at the cafe had a bit of an incident. The top of the hose flew off, she drenched both herself and Husband. Perched on a chair by the water’s edge he had literally nowhere to go. Needless to say I found it side splittingly hilarious. Ironic too – even on this one sunny Yorkshire day he still returned home soaked to the skin…. Thanks Lorelle – yes, it was a bit of a shock to the system for him but I found it incredibly funny!! Once he got over the shock he did too!! This is so beautiful and romantic. Thank you for sharing, Joy. I love this!! Isn’t it just the most gorgeous little place Erika – worth the hike for sure!! Hope you’re having a good Sunday!! The hike is actually an important part of the whole experience. Absolutely wonderful. Thank you and you too, Joy! It was a tough climb back up Lynn – I was glad when we reached the top again but you’re right, it was worth it!! The expression on his face was priceless – I wish I’d captured it!! Warm and sunny plus water, I bet he was a little cooler because of it. And it must have been funny. So funny Terry, but at least the sun was shining that day!! The ending was hilarious! Love your adventures and thanks so much for sharing them! I’m in shock seeing the blue skies and sunshine!! Husband could probably do with the cooling shower on such a hot day 🙂 ! Getting soaked was par for the course on this holiday!! It was hilarious (for me anyway!!). What a lovely day out and to get some sunshine at last. It must have been funny when the home fell off, just as well you were heading back to the cottage soon afterwards Joy. It was so funny Marion – the expression on his face alone nearly made me split my sides with laughter. It was nice though at long last to have sunshine, warmth and blue skies! It was so peaceful and scenic George – the perfect place to stop for a while after a hike. Another hilly hike Rosemary but definitely worth it – I can say that now but at the time when I was sweating and huffing and puffing I wasn’t so sure..